Recently, Himachal Pradesh Staff Selection Commission released an advertisement of 1724 vacancies in the various department. 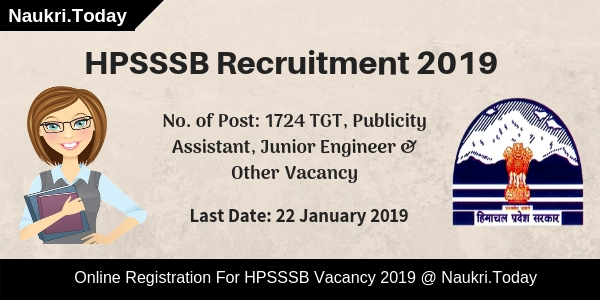 The candidates who are interested in HPSSSB Recruitment 2019 can apply Online for TGT, Publicity Assistant, Junior Engineer, and other Vacancies. Registration for the HPSSC Vacancy 2019 has been started from 23 December 2018 and Closing date of filling online form is 22 January 2019. Candidates will get complete details about the Himachal Pradesh SSSB Bharti 2019 like Eligibility Criteria, Pay Scale, Application fee etc in the coming article. You can also check the official links to Download the HPSSC Vacancy 2019 notice and Apply Online form for HPSSSB Vacancy, which is also mentioned in the end. What Are The Crucial Dates for HPSSSB Vacancy 2019? HPSSSB Jobs Location: Himachal Pradesh. Fresh Update as on 31.12.2018: Dear Applicants, HPSSSB Recruitment 2019 is avilable for 1724 TGT, Publicity Assistant and Other Posts. Candidates may apply online for HPSSSB Jobs 2019 from here. Aspirants should collect qualification, age , and application fee details from here. Fresh Update as on 24.12.2018: Applicants who are looking for TGT, Junior Engineer & Other posts can apply for HPSSSB Recruitment. Candidates can see all details relevant to HPSSSB Jobs in given article. Last date for submission of online application form is 22.01.2019. Participants should have done 10th, 12th, Graduation and Post Graduation Degree from a recognized Board or University. You can check the official notification for more details regarding the education qualification required for Himachal SSSB Recruitment. The candidates should be in the age group of 18 to 45 years to apply for HPSSSB Recruitment. 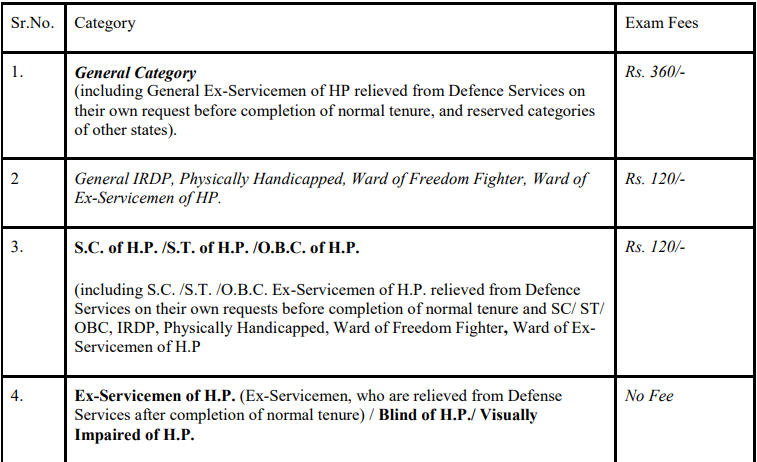 Age relaxation will be given to the candidates of SC, ST, PWD of 05 Years in upper Limit for HPSSSB Jobs 2019. Participants who wish to apply for Himachal Pradesh SSSB Jobs 2019 need to pay an application fee. You can submit the application fee through three modes i.e. Online Payment Gateway, Offline Computer Generated Challan, Lokmitra Kendra. Himachal Pradesh Service Selection Board will select the candidates for HPSSSB Jobs 2019 on the basis of Written Screening Test, Skill Test, and Physical Test. The Written Screening Test may be conducted in Objective Type or Descriptive and both. Candidates will be shortlisted for Skill Test and Physical Test on the basis of their performance in the Written Screening Test. The participants who want to apply Online for HPSSC Jobs 2019 can check the simple steps given below. Applicants must apply before the closing date of the registration i.e, 22 January 2019. Here our team is providing you easy and simple steps to download HPSSSB Bharti 2019 notification pdf and Apply Online link. Log on to the official website i.e. hpsssb.hp.gov.in. 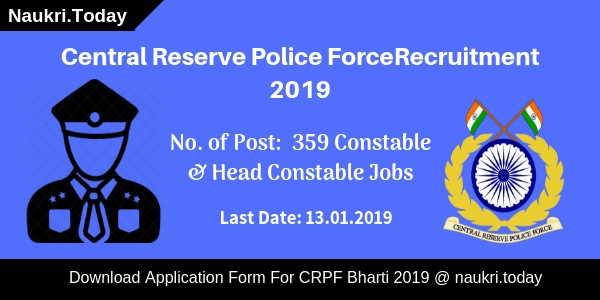 Then, click on notification for “HPSSSB Recruitment 2019”. Then, notification will open, read it completely. If you are eligible click on “Apply Online” link. Fill all the details carefully and completely. Recheck all the details and pay the application fee. Conclusion: HPSSSB Recruitment 2019 advertisement is published on its official web portal. The department released recruitment notice for 1724 vacancies in the different department. You can apply online before the last date i.e. 22.01.2019. Candidates who are waiting for Job Opportunity in Himachal Pradesh, Here is a good news for you. Himachal Pradesh Staff Selection Commission has released notification of 119 Clerk Vacancies. Interested candidates can apply application form through offline mode for HPSSSB Recruitment 2017. Closing date for submission of application form is 15.03.2017. HPSSSB Department which is also known as Himachal Staff Selection Commission. Department has published recruitment advt. for 119 Clerk Vacancies. Those candidates who are searching for Hamirpur HPSSSB Clerk vacancy have a chance to apply application form till the last date. For more information about HPSSC Clerk Vacancy like Eligibility Criteria & Other you can check from given below details. HPSSSB Vacancy 2017 Education Qualification : Candidates should have done 10+2 or equivalent qualification from recognized University for HPSSSB Jobs 2017. Applicants must have knowledge of Typing Skill for applying HPSSSB Clerk Vacancy 2017. Age Limit For HPSSSC Hamirpur Recruitment 2017 : Age of the candidates for HPSSSB Recruitment 2017 is applicable as per Department rules & regulation. Relaxation in age is applicable only for reserved category candidates for HPSSC Jobs 2017. HPSSSB Recruitment 2017 Application Fee : General Category candidates should paid Rs. 360/- for applying HPSSSB Application form. Other Category candidates like SC/ST/OBC Candidates need to pay Rs. 120/- for filling up HPSSSB Clerk Vacancy Online Form. application fee should paid through Demand Draft or Postal Order. Pay Scale For Himachal SSC Clerk Vacancy 2017 : Selected candidates will paid pay band for HPSSSB Clerk Jobs 2017 as per Department Norms. Candidates can check more information about Pay scale or other fro HPSSSB Jobs from official notification. First of all candidates call for Objective type Screening Test. Exam will contain question of English, Hindi, GK, Current Affairs, Everyday Science & Other. Total Marks of Written Exams will be 200 marks. Candidates should get minimum passing marks for qualifying the exam. After that selected candidates call for 20 Marks. It is compulsory to clear the typing Test. Final Selection of the candidates for HPSSC Hamirpur Recruitment 2017 will based on merit list. For more details about Exam Date & Other you can check from here. Keep visit this page for more updates related to HPSSC Hamirpur Jobs. Candidates can also check Upcoming Recruitment Notification from here. How I Fill Application Form for HPSSSB Recruitment 2017/ Hamirpur Clerk Jobs 2017 ? First of all open the Official Website www.hpsssb.hp.gov.in. Now click on HPSSSB Clerk Jobs Notification link. Read all the information from notification. If you are eligible then click on download application form. Take print out of it & Fill all information in form properly. Attach passport size Photo & required documents with form. Attach a copy of application fee with application form. Now the send the application form on correct postal address. Conclusion :- HPSSSB Recruitment 2017 for 119 Clerk Jobs. candidates can fill application form for HPSSSB Hamirpur Vacancy on or before the last date 15.03.2017. Himachal Pradesh SSSB is inviting online application for Various HPSSSB Vacancy 2016. Govt. of Himachal Pradesh has released 2408 Jr Engineer, Office Assistant & Other Post. Those candidates who are looking for HPSSSB Recruitment 2016 – 17 should apply application form through online mode. 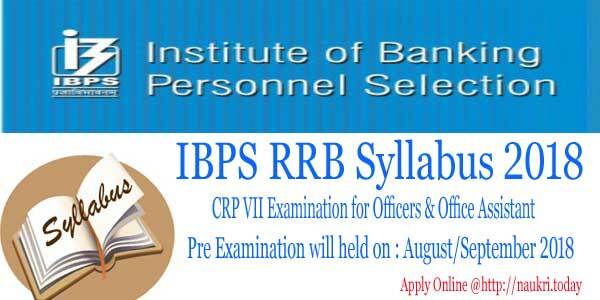 Eligible candidates can fill HPSSSB Online Application on or before the last date 17.11.2016. Himachal Pradesh Subordinate Selection Commission (HPSSSB) has published recruitment notification for 2408 Various Vacancy. This is a golden opportunity for those candidates who are looking for Jobs in Himachal HPSSSB. To get more details like Age limit, Education Qualification etc. you can check details which is mentioned below. Jr Engineer(Civil) 168 Post Rs. 10,300/- to 34,800/- + GP Rs. 3,800/-. Jr Engineer(Elect.) (PWD) 10 Post Rs. 10,300/- to 34,800/- + GP Rs. 3,800/-. Jr Engineer(Mechanical) 01 Post Rs. 10,300/- to 34,800/- + GP Rs. 3,800/-. Horticulture Extension Officer 06 Post Rs. 5,910/- to 20,200/- + GP Rs. 2,400/-. Press Duftry 02 Post Rs. 5,910/- to 20,200/- + GP Rs. 1,900/-. Data Entry Operator(DEO) 02 Post Rs. 5,910/- to 20,200/- + GP Rs. 1,900/-. Civil Defence instructor/ Chief Instructor/ Platoon Commander etc. 06 Post Contractual Amount Rs. 13,900/-. Havildar Instructor/ Quarter Master Havildar 07 Post Contractual Amount Rs. 8,310/-. Pump Operator 250 Post Rs. 10,300/- to 34,800/- + GP Rs. 4,200/-. Marketing Assistant 02 Post Rs. 10,300/- to 34,800/- + GP Rs. 4,200/-. Junior Engineer (Civil) (HPMC) 01 Post Rs. 10,300/- to 34,800/- + GP Rs. 3,800/-. Junior Accountant 08 Post Rs. 10,300/- to 34,800/- + GP Rs. 3,800/-. Assistant Technical Officer 04 Post Rs. 10,300/- to 34,800/- + GP Rs. 3,600/-. Assistant Programmer 01 Post Rs. 10,300/- to 34,800/- + GP Rs. 4,200/-. Computer Operator 02 Post Rs. 10,300/- to 34,800/- + GP Rs. 3,600/-. Boiler Operator 02 Post Rs. 5,910/- to 20,200/- + GP Rs. 2,400/-. Refrigeration Plant Operator 05 Post Rs. 5,910/- to 20,200/- + GP Rs. 2,400/-. Sr.Scale Stenographer 02 Post Rs. 10,300/- to 34,800/- + GP Rs. 4,200/-. Jr.Scale Stenographer 02 Post Rs. 10,300/- to 34,800/- + GP Rs. 3,200/-. Steno-typist 03 Post Rs. 5,910/- to 20,200/- + GP Rs. 1,900/-. Clerk (HPMC) 04 Post Rs. 5,910/- to 20,200/- + GP Rs. 1,900/-. Senior Laboratory Technician 63 Post Rs. 10,300/- to 34,800/- + GP Rs. 3,200/-. Laboratory Assistant 58 Post Rs. 5,910/- to 20,200/- + GP Rs. 2,000/-. Dark Room Attendant 01 Post Rs. 5,910/- to 20,200/- + GP Rs. 1,900/-. Mechanic 01 Post Contractual Amount Rs. 7,810/-. Salesman 03 Post Rs. 5,910/- to 20,200/- + GP Rs. 1,900/-. Master Craftsman 02 Post Rs. 5,910/- to 20,200/- + GP Rs. 1,900/-. Junior Office Assistant 704 Post Rs. 5,910/- to 20,200/- + GP Rs. 1,950/-. Inspector (Hotel) 04 Post Rs. 10,300/- to 34,800/- + GP Rs. 3,800/-. Tourist Information Officer 05 Post Rs. 10,300/- to 34,800/- + GP Rs. 3,800/-. Assistant Chemist 01 Post Contractual Amount Rs. 11,170/-. Junior Engineer (IT) 10 Post Rs. 10,900/- to 34,800/- + GP Rs. 3,200/-. Supervisor 50 Post Rs. 10,300/- to 34,800/- + GP Rs. 3,200/-. Marketing Assistant 07 Post Rs. 14,100/-. Accountant 03 Post Rs. 14,100/-. Manager(Industrial Estate/Area) 02 Post Rs. 10,300/- to 34,800/- + GP Rs. 3,200/-. Jr. Scale stenographer 01 Post Rs. 8,710/-. Operation Theatre Assistant 02 Post Rs. 5,910/- to 20,200/- + GP Rs. 2,000/-. Ayurvedic Pharmacist 148 Post Rs. 5,910/- to 10,300/- + GP Rs. 3,000/-. Supervisor 37 Post Rs. 10,300/- to 34,800/- + GP Rs. 3,200/-. Language Teacher 123 Post Rs. 13,550/-. Drawing Master 79 Post Rs. 13,550/-. Physical Education Teacher 118 Post Rs. 13,550/-. Shastri 236 Post Rs. 13,550/-. Field Assistant 01 Post Rs. 10,300/- to 34,800/- + GP Rs. 3,200/-. Reeling Demonstrator 01 Post Rs. 5,910/- to 20,200/- + GP Rs. 2,400/-. Jr Analyst 02 Post Rs. 5,910/- to 20,200/- + GP Rs. 2,800/-. Junior Engineer (Horticulture) 07 Post Rs. 10,300/- to 34,800/- + GP Rs. 3,800/-. Clerk 02 Post Rs. 5,910/- to 20,200/- + GP Rs. 1,900/-. Junior Engineer (Elect.) (HIMUDA) 02 Post Rs. 10,300/- to 34,800/- + GP Rs. 3,800/-. Junior Engineer (Elect) 240 Post Rs. 10,900/- to 34,800/- + GP Rs. 4,350/-. Junior Engineer (Elect) (HPTCL) 01 Post Rs. 10,900/- to 34,800/- + GP Rs. 5,350/-. Jr Draughtsman(Civil) 04 Post Rs. 8,310/-. Ophthalmic Officer 02 Post Rs. 10,300/- to 34,800/- + GP Rs. 3,600/-. Education Qualification for HPSSSB Bharti 2016 : Candidates who are going to apply for Hamirpur HPSSSB Vacancy 2016 should have done. 10+2/ Diploma/ Bachelor’s Degree/ Master’s Degree or equivalent in relevant Field. Applicants should also have done your qualification from recognized University/ Institute for HPSSSB Recruitment2016. Check post wise education Criteria from HPSSSB Notification. HPSSSB JE Vacancies 2016 Age Limit : Minimum age of the candidates for HPSSSB Vacancies 2016 – 17 should be 18 years & upper age must be 45 years as on 01.01.2016. Age relaxation is applicable up to 05 years for SC/St/OBC/PWD Category candidates for HPSSSB Office Assistant Vacancy 2016. Application Fee for HPSSSB Recruitment 2016 : Check Application fee for HPSSSB Jr Engineer Jobs 2016 from official Advertisement. HPSSSB Vacancy 2016 Pay Scale : Candidates can check post wise pay scale which is mentioned in above table for HPSSSB Vacancy 20156. Department will conduct Screening & Skill Test for recruiting candidates on HPSSSB Jobs 2016. First of all department will conduct Screening Test + Skill Test of 200 Marks. in This Examination Question will be made on the basis of GK, Matter of Qualification Subjects. After that shortlisted candidates will called for Interview test which will be of 50 Marks. Candidates will be called for Typing Test who applied Typist & Related Vacancy. for Final Selection will be made on the basis of Marks obtain in examination. Check full details about Admit card & Syllabus from here. Keep Visit this page for future updates for HPSSSB Recruitment 2016. How I Apply Online For HPSSSB Recruitment 2016 – 17 ? Candidates can visit to the HPSSSB Website. First of all click on official Himachal Pradesh SSSB notification link,. Make all information without any mistake in form. Upload scanned photo & signature in application form. Recheck all details in form & Pay Application fee if required. Than click on submit button. HPSSSB Recruitment 2016 – 17 for 2408 JE, Office Assistant & Other Post. Candidates should apply application through online mode for HPSSSB Vacancies 2016 before the last date, that is 17.11.2016.